Looks like you are currently in United States but have requested a page in the New Zealand site. Would you like to change to the New Zealand site? Around 1637, the French jurist Pierre de Fermat scribbled in the margin of his copy of the book Arithmetica what came to be known as Fermat's Last Theorem, the most famous question in mathematical history. Stating that it is impossible to split a cube into two cubes, or a fourth power into two fourth powers, or any higher power into two like powers, but not leaving behind the marvelous proof he claimed to have had, Fermat prompted three and a half centuries of mathematical inquiry which culminated only recently with the proof of the theorem by Andrew Wiles. This book offers the first serious treatment of Fermat's Last Theorem since Wiles's proof. It is based on a series of lectures given by the author to celebrate Wiles's achievement, with each chapter explaining a separate area of number theory as it pertains to Fermat's Last Theorem. Together, they provide a concise history of the theorem as well as a brief discussion of Wiles's proof and its implications. Requiring little more than one year of university mathematics and some interest in formulas, this overview provides many useful tips and cites numerous references for those who desire more mathematical detail. The book's most distinctive feature is its easy-to-read, humorous style, complete with examples, anecdotes, and some of the lesser-known mathematics underlying the newly discovered proof. In the author's own words, the book deals with "serious mathematics without being too serious about it." Alf van der Poorten demystifies mathematical research, offers an intuitive approach to the subject-loosely suggesting various definitions and unexplained facts-and invites the reader to fill in the missing links in some of the mathematical claims. Entertaining, controversial, even outrageous, this book not only tells us why, in all likelihood, Fermat did not have the proof for his last theorem, it also takes us through historical attempts to crack the theorem, the prizes that were offered along the way, and the consequent motivation for the development of other areas of mathematics. Notes on Fermat's Last Theorem is invaluable for students of mathematics, and of real interest to those in the physical sciences, engineering, and computer sciences-indeed for anyone who craves a glimpse at this fascinating piece of mathematical history. This book displays the unique talents of author Alf van der Poorten in mathematical exposition for mathematicians. Here, mathematics' most famous question and the ideas underlying its recent solution are presented in a way that appeals to the imagination and leads the reader through related areas of number theory. 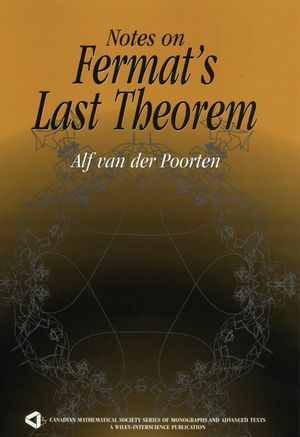 The first book to focus on Fermat's Last Theorem since Andrew Wiles presented his celebrated proof, Notes on Fermat's Last Theorem surveys 350 years of mathematical history in an amusing and intriguing collection of tidbits, anecdotes, footnotes, exercises, references, illustrations, and more. Alf van der Poorten is Director of the Centre for Number Theory Research and Head of the School of Mathematics, Physics, Computing, and Electronics at Macquarie University in Sydney, Australia. Over the past twenty years he has held short-term visiting positions at various universities in North America and Europe, and has made important contributions in a number of areas of mathematical research. Dr. van der Poorten is well known internationally as an amusing lecturer and expositor and has published over one hundred papers, primarily on topics inspired by number theoretical problems. Why Do We Believe Wiles? A Child's Introduction to Elliptic Functions. Zeta Functions and L -Series. Class Number of Imaginary Quadratic Number Fields.